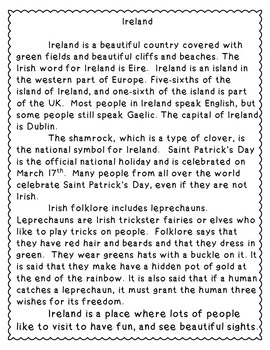 This reading comprehension passage about the country of Ireland for grades 1-3 can be used in your class to help your students with reading comprehension skills as well as with test taking skills. Please take a preview peek! An engaging passage with 4 multiple choice questions and 2 written responses. 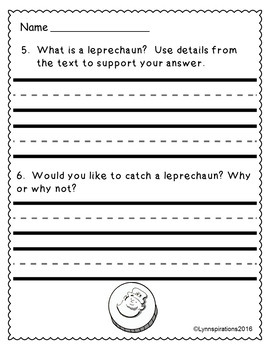 Saint Patrick's Day Reading comprehension Grades 1-3 Non-fiction! 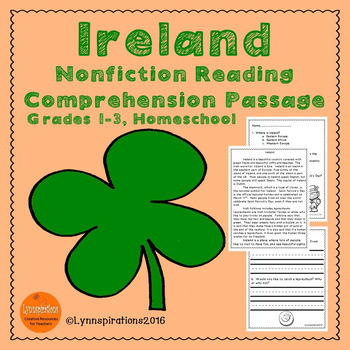 Click below for February Bundle Individual Links Reading Comprehension Resources Grades K-3! President's Day Grades 1-3 Non-fiction! Abraham Lincoln Grades 1-3 Non-fiction! George Washington Grades 1-3 Non-fiction! Valentine's Day Grades 1-3 Non-fiction! Groundhog Day Grades 1-3 Non-fiction!